Can be Mounted to the Stud or the Wall (Surface or Flush Mount). Modular Design enables customization for each housing requirement. Designed for use with most manufactures Video/Phone/Network Inserts. Designed for use with the Etcon DD1. The most efficient 110-phone distribution module. 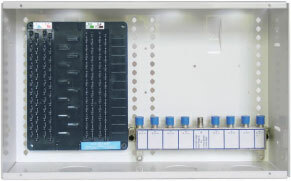 Designed for use with the Etcon X1 8-Way 2GHz Video Splitter with all ports on 1 side and labeling capabilities. Dimensions: 14.25" x 9.00" x 3.50"